The word "revolutionary" gets bandied about quite a bit, particularly when Apple is involved. And to hear some people talk, the iPad tablet threatens the viability of all existing netbooks and e-readers while promising to usher in a new era of tablet computing. Those rosy predictions may or may not be valid, but what about the important things--namely, video games? As a gaming platform, the iPad has a lot going for it. The sheer number of applications already available is staggering, to say nothing of legacy applications for the iPhone and the iPod Touch. And though I wasn't particularly impressed with how double-pixel applications looked, backward compatibility is sure to please users with heavy investments in App Store products. The iPad's biggest drawback as a gaming platform is mirrored across all of its use cases: How the heck are we supposed to hold this thing? At 1.5 pounds it's heavier than it looks, but trickier still is the business of manipulating the expansive screen while holding it aloft. I had the most success sitting upright on a couch (as the iPad ads encourage users to do). Playing while lying in bed was doable, too, though a bit more cumbersome than with the Nintendo DS or Sony PSP. The iPad's beautiful 9.7-inch display makes games look great. 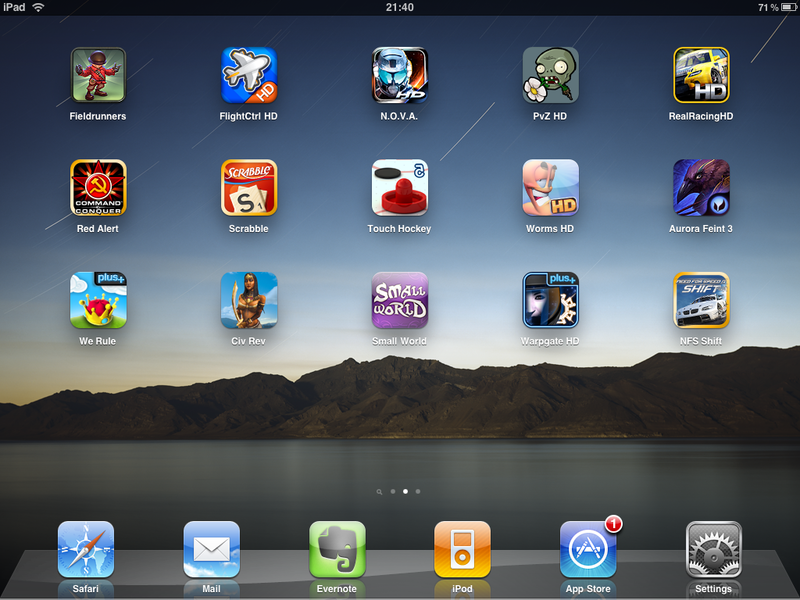 Shown here: An iPad homescreen containing icons for various games, including the three specifically discussed in this review. The iPad hardware leaves little room for complaint. The 9.7-inch screen is gorgeous; and though the 1024-by-768-pixel resolution may be a bit less precise than what you'd get on a television or a PC monitor, most of the native iPad games are quite stunning. Less welcome were the smudges that began building up on my screen after only an hour or so of play. If you plan to do a lot of iPad gaming, keep a screen cleaner handy. Battery life is exceptional: After six or seven hours of extended informal testing, during which I ran the iPad on Wi-Fi and downloaded and played a number of games, my battery meter hovered near the 30 percent mark. As you would with most other portable electronic devices, you'll want to pack a pair of headphones. Sound quality from the single iPad speaker is fine, albeit lacking in bass or depth, when the speaker isn't obstructed. Unfortunately, such obstruction can happen easily--particularly if the game you're playing takes advantage of the accelerometer. Ultimately, the applications will make or break this device as a gaming platform. And in this regard, the initial App Store offerings do not disappoint. Even better, games available now provide an excellent view of the iPad's strengths and weaknesses, and offer a few interesting lessons for developers. Board-game aficionados, your electronic gaming platform is here. Though the iPad's $500 price tag means that it won't threaten the market for cardboard and plastic pieces with extinction anytime soon, the device's size and perpetual connection make it a great fit for group games and shared spaces. Scrabble leads the charge, with a readily accessible app from Electronic Arts. 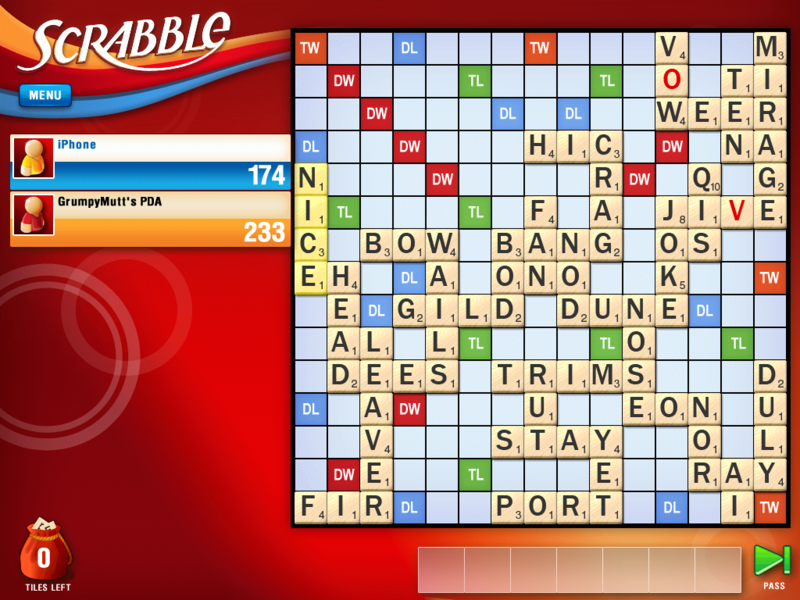 EA's Scrabble app for the iPad is a board game made in electronic heaven. EA's Scrabble app takes advantage of Facebook Connect, to keep iPad owners up to speed with their browser-based brethren. We may lament the increasing encroachment of backlit screens on our social lives, but asynchronous gaming that keeps friends connected with a minimum of fuss--despite schedules or time zones--is always a good thing. When you do have a bit of time to gather with friends, breaking out the iPad to play a bit of Scrabble isn't as awkward as you might think--and not having to set up or clean up keeps things casual. If you're limited to a single iPad, the device is light enough to be passed around with ease, and the application is simple enough that anyone to figure out how to play it. 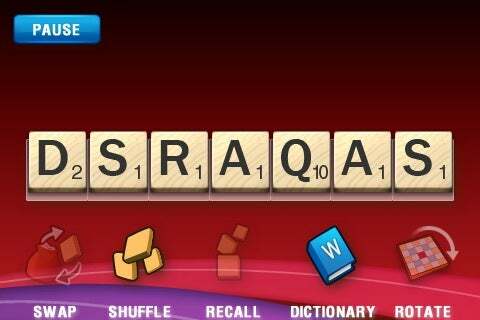 EA's Scrabble app lets you use your iPhone or iPod Touch as a tile rack for your Scrabble letters. Then there's the Party Play feature. With the iPad lying in a central location as the board, up to four players can compete, using their iPhones and iPod Touches as personal tile racks. After all of the players have downloaded a free app onto their Apple handheld, they'll be able to sync with the iPad, rearrange their tiles and flick them onto the board, or browse a Scrabble dictionary for valid words. True, it's a bit gimmicky--but it's also fun, and it adds some nostalgic value, with your letters safe from roaming eyes. EA may have the board game with the highest profile out on the App Store, but with this much money lying on the table, a digital board game revival can't be too far behind.